Anders Østergaard's award-winning documentary shows a rare inside look into the 2007 uprising in Myanmar through the cameras of the independent journalist group, Democratic Voice of Burma. While 100,000 people (including 1,000s of Buddhist monks) took to the streets to protest the country's repressive regime that has held them hostage for over 40 years, foreign news crews were banned to enter and the Internet was shut down. The Democratic Voice of Burma, a collective of 30 anonymous and underground video journalists (VJs) recorded these historic and dramatic events on handycams and smuggled the footage out of the country, where it was broadcast worldwide via satellite. Risking torture and life imprisonment, the VJs vividly document the brutal clashes with the military and undercover police – even after they themselves become targets of the authorities. Born 1965. Graduated from the Danish School of Journalism in 1991. Awarded Best Documentary at Odense International Film Festival in 1999 for The Magus. Writer-director on the international awarded Tintin et moi (2003), and the documentary about one of Denmark's most popular rock bands Gasolin (2006), which had a successful run at the domestic box office with 223,000 admissons. 2008: Burma VJ (2008): selected for Joris Ivens Competition and Movies That Matter, IDFA, Amsterdam. Sä kort og mærkeligt livet er, about the Danish poet Dan Turèll, was selected for the opening gala at CPH:DOX. Anders Østergaard (b. 1965) made his first big impression on Danish cinemagoers in 2006 with Gasolin', a documentary about a singularly popular Danish rock band from the 1970s. Though Gasolin', fronted by charismatic singer Kim Larsen, never gained a following outside Scandinavia, in Denmark they enjoyed years of Beatles-like stardom. Following its 1978 break-up, the group became part of the Danish cultural heritage. The Gasolin' film drew 223,000 Danes to cinemas, an exceptionally high number, not just for a documentary but by any standard. Mixing documentary footage with staged shots has been a hallmark of Østergaard's films almost from the beginning. A rare exception was Gensyn med Johannesburg (1996). In this relatively conventional documentary, Østergaard follows the Danish filmmaker Henning Carlsen on a trip to South Africa to revisit some of the people who appeared in Carlsen's Dilemma, a pioneering 1961 docudrama based on a novel by Nadine Gordimer and shot without the consent of the South African authorities. In his next film, Troldkarlen (1999), about the Swedish jazzman Jan Johansson who died on an icy road in 1968 at the age of just 37, Østergaard truly came into his own as a documentary filmmaker wielding a remarkably wide repertoire of filmic ideas, including the use of staged shots. Notoriously, he recreated Johansson's fatal car accident with a stand-in behind the wheel. This tendency was accentuated in Tintin et moi (2003), a film about Hergé, the creator of Tintin, that became Østergaard's international breakthrough. Adding 3D effects to Hergé's cartoons et the camera explore an otherwise two-dimensional universe, while a special animation technique brought the deceased cartoonist back to life. Hergé, whose real name was Georges Rémi, was almost as famous for being tight-lipped about his thought and feelings as for his comic adventures about the intrepid reporter Tintin. Accordingly, it caused widespread surprise in 1971 when an interview by a French student, Numa Sadoul, spontaneously evolved into a four-day talk. Without warning, the cartoonist had opened the floodgates, casting his 23-year-old listener in the role of psychoanalyst and commiserator. Østergaard wanted the audiotapes of this legendary interview to be the core of his film and, after long deliberation, the trustees of Hergé's estate finally released them. But the Danish filmmaker wasn't content simply to include Hergé's voice on the soundtrack. Using so- called sketch-line animation, he resurrected his subject as a speaking cartoon character, breathing life into material that, in the hands of a less inventive filmmaker, could easily have become just another dusty archival montage with talking heads. 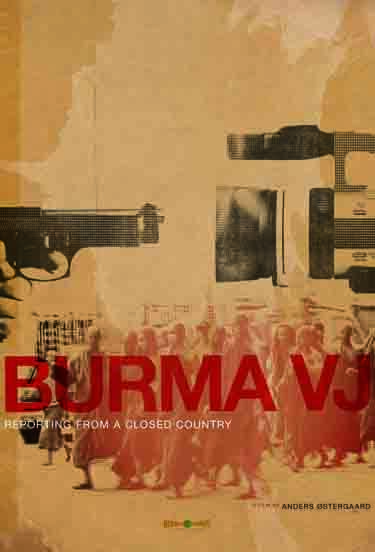 Audio commentary with BURMA VJ director Anders Østergaard and film critic John Anderson. FIGHTING FOR FREEDOM – a video interview with BURMA VJ "Joshua". Burmese Monks' stories from the uprisings televised on Democratic Voice of Burma. A video message from Richard Gere. CROSSING MIDNIGHT – a riveting film about refugees on the Thai/Burma border. Join our fun, non-spammy mailing list for the latest O-Scope dispatches and exclusive content.